Successfully Added Wireless PTZ IP Security Camera "Gator" - 1/4 Inch CMOS Sensor, 720p, 5x Digital Zoom, Night Vision, IR Cut to your Shopping Cart. 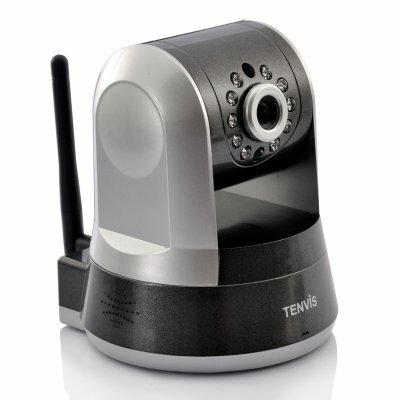 Wireless IP Security Camera with 5x Digital Zoom, PTZ Control, Night Vision, IR Cut, and more, is now available at an incredible low wholesale price. Secure your property now with the “Gator” IP PTZ camera! Instantly access the “Gator’s” video feed from your Smartphone or from any PC connected to the internet to check up on your property. This PTZ IP camera grants you access from anywhere in the world can be controlled remotely. Rotate the camera 345 degrees horizontally and 120 degrees vertically for a complete view of the room the “Gator” is standing in. Installing the camera couldn't be easier, just plug in the power adaptor, connect the "Raptor" to your Wi-Fi network and your're all set! No annoying cable to connect and no holes to drill. The “Gator’s” 10 IR LED lights turn on automatically in low light conditions for perfect night images up to 10 meters far and the 5x digital zoom can give you close ups of even the smallest details. On top of that, this powerful IP camera shoots 720p footage, giving you crystal clear images of the intruders. Don’t wait till it’s too late, secure your property now with this semi-professional IP security camera. I've been using this camera for almost one year.No problems. Detailed picture, nice colors etc. I would buy a second one, no doubt about it. Couple of IR LEDS apparently not working any more. No other problems though.